Tuesday, April 23rd from 6:30-8:00pm. NEW LOCATION: Heath High School, 300 Licking View Drive, Heath, Ohio. 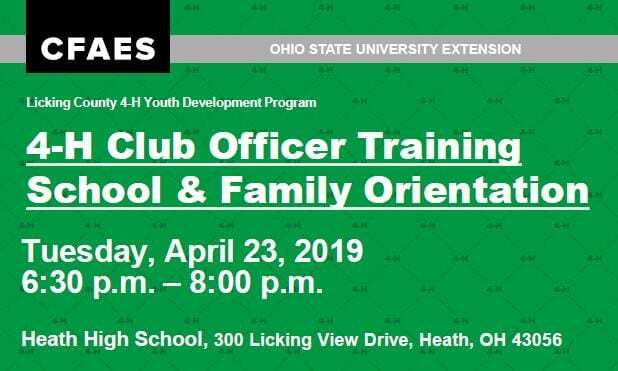 4-H Officer Training School will assist in preparing club officers to fulfill their responsibilities as club officers through providing instruction and helpful resource materials. Officers will have an opportunity to actively participate in sessions and ask any questions they may have about their roles and responsibilities. The 4-H Family Orientation will be beneficial for those 4-H parents who wish to learn more about opportunities available through the 4-H program and how they as parents can effectively support their children as they enjoy all 4-H has to offer. Prizes offered to the 4-H clubs with greatest number of members in attendance! Posted in 4-H, Club Officers, Events, Information, Workshop	Bookmark the permalink.